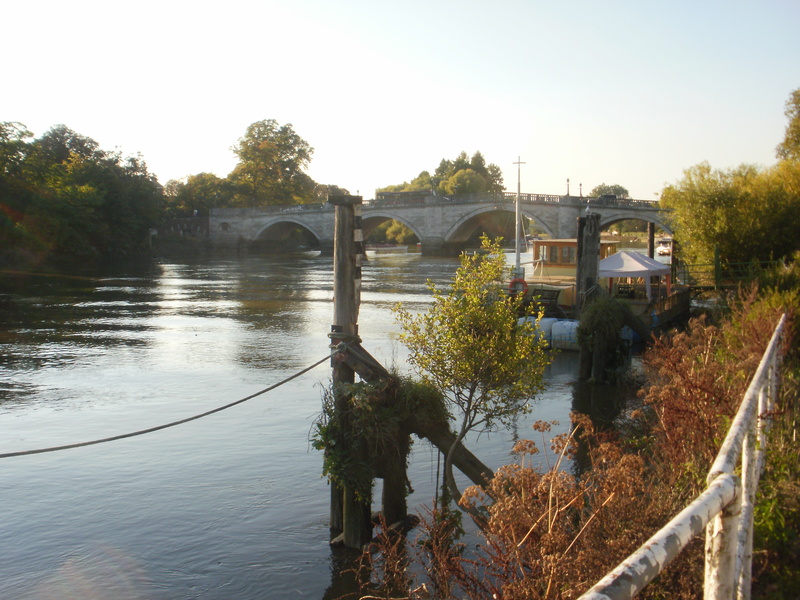 We had got a good long section of the Thames Path to do, from Hampton Court, past Hampton Court Palace, Kingston on Thames, onto the tidal Thames at Teddington, then Twickenham, and finally to Richmond on Thames. That’s a lot of “stuff” to fit into a walk, even before a few geocaches were added to the mix! 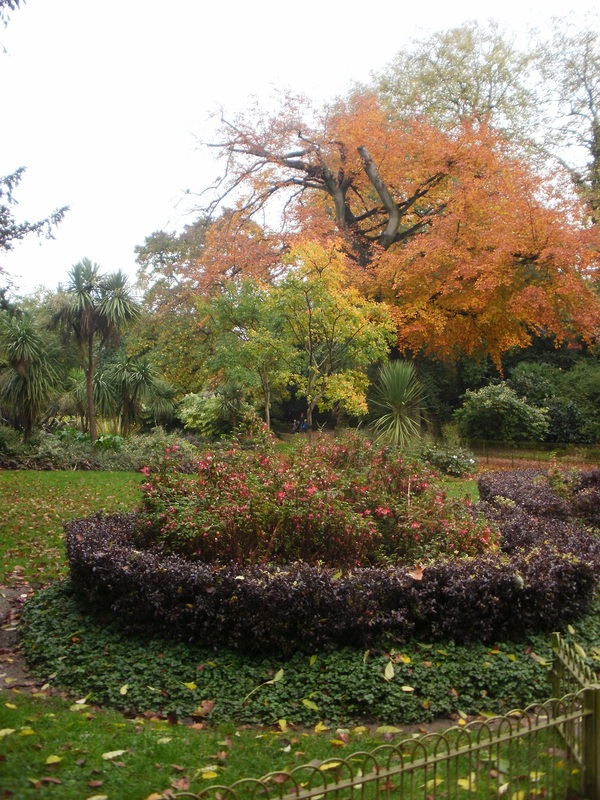 We had (luckily) chosen a beautiful sunny day, just as it was at the end of June when we visited the Hampton Court Flower Show; but it was so, so much cooler; it had been 33C that day and today was much more pleasant, a lovely warm autumn day. Leaving Hampton Court station, it was but a few yards to the bridge over the Thames, where we grabbed the first cache of the day before setting off on the big loop of towpath past Hampton Court Palace. 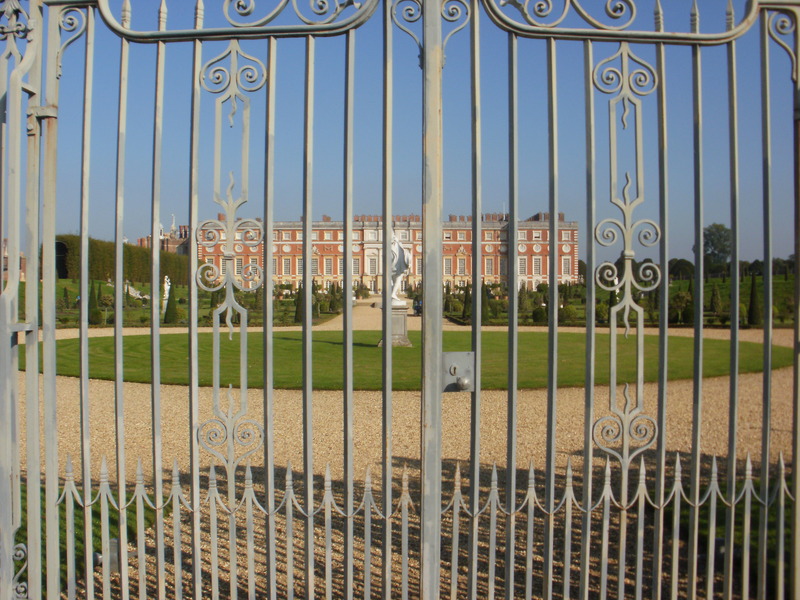 There was a theme to the first few caches – Catherine of Aragon / Carry on Henry / Anne Boleyn / Hampton Court Garden Gateway – which was all very appropriate with the palace just over the towpath wall. We swiftly moved on to the next three caches, which we was eagerly anticipated. All three were tree climbs. We are not especially good at any cache that isn’t on the ground, and trees – well, best not to dwell on that. I volunteered for the first tree climb. It was quite some way up, and part of it used a fixed rope; Mr Hg137’s arm had healed well since he broke it in May, but it probably wasn’t yet up to climbing ropes. Up I went. It seemed very much further up than it had from the ground. I wasn’t conscious of it, but I’m told that I repeated “you can do this … you can do this … you can do this” over and over throughout the entire episode! After what seemed like several days but was probably about five minutes, I reached the top of the rope, and then a small extra climb and a couple of desperate lunges allowed me to grab the cache. I was about six metres up the tree (not that I was looking down). Then I dropped the cache lid … ouch. Mr Hg137 ably came to the rescue. I climbed down a bit, and he held up the lid, poised on a fully extended geopole held above his head. After what seemed like several more days, but was probably another five minutes, I had replaced the cache and abseiled back down the rope, and had my feet back on the ground. After some patting myself on the back and congratulating myself, we set off again; but my knees no longer seemed to belong to me, and I was talking gibberish, (even more than normal); I assume it was the spare adrenalin left over from the tree climb; things returned to ‘normal’ after a few minutes. The other two tree climbs were ably performed by Mr Hg137. He has longer legs than me and could easily manage to jam himself between tree trunks and climb upwards. 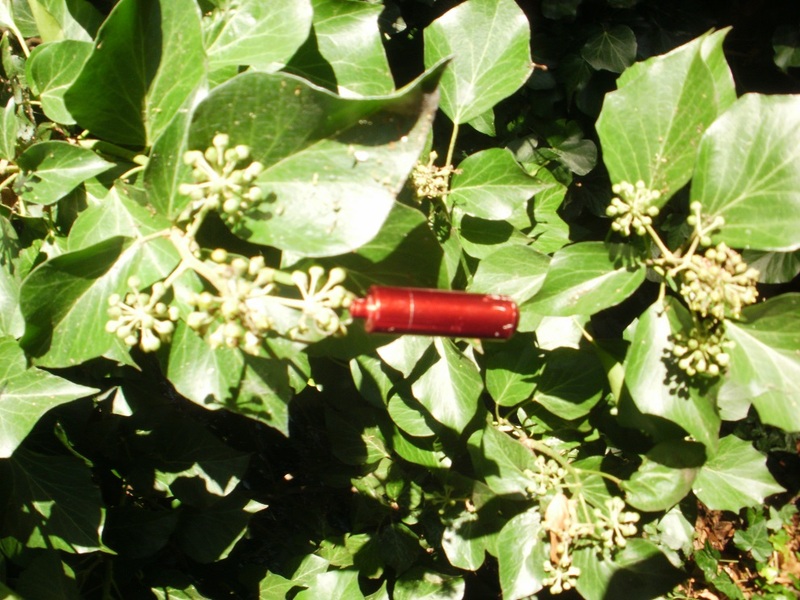 It seemed as if those caches were retrieved within seconds, but it wasn’t me up the trees! How the perception of time does vary, depending on what you are doing! 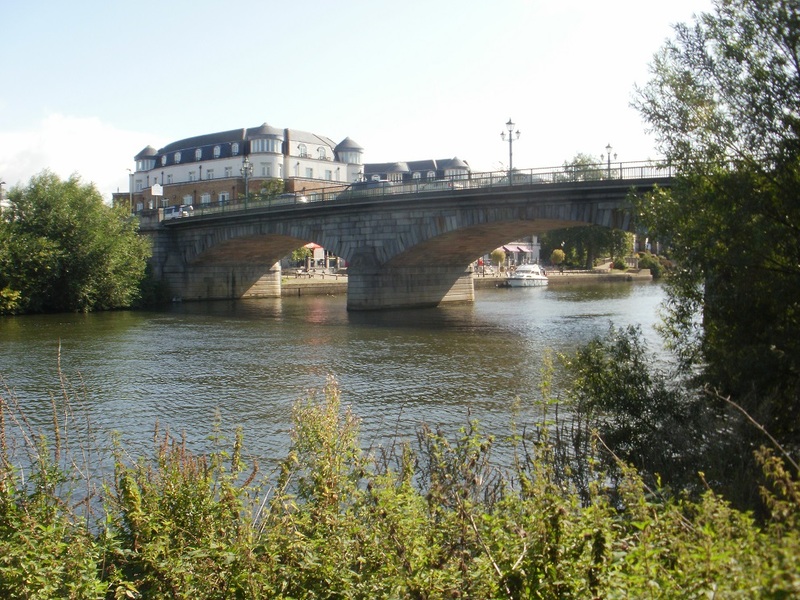 Another cache brought us to Kingston Bridge, and here we diverted from the Thames just for a few minutes to take in an Earth cache, ‘Where England Began’, which was a sarsen stone that participated in the coronation of seven Anglo-Saxon kings. We would never have found this by ourselves, and it was an unexpected pleasure to walk through Kingston market on a busy Friday and to see the throngs of people enjoying the riverside. 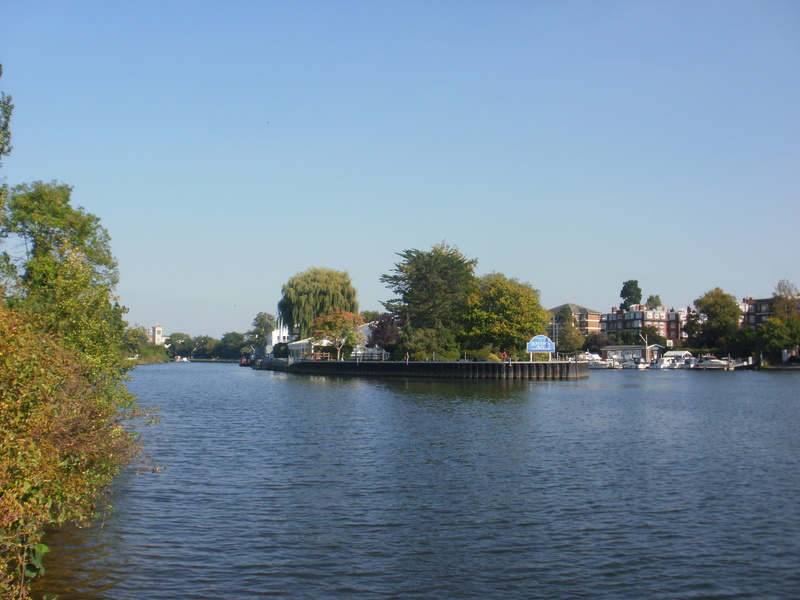 Teddington Lock is a little way downstream from Kingston. This is a big, big point on the Thames as it marks the point where the Thames becomes tidal, with a big, big lock, too. Here, too, is a terrain 5 cache (the hardest), ‘Treeless T5 in Teddington: Look Out at the Lock’, hidden somewhere on a wooden structure mid-river; we looked, but didn’t attempt, as we hadn’t brought either a boat or waders. Once below the lock, beside tidal water, the river was visibly different, with gravelly shoals at low tide and then filling with fast moving brown water: quite a difference. There were more caches along the riverside as we walked between Teddington, Twickenham, and Richmond. We didn’t find all of them, only four out of seven, and we assumed at the time that we were flagging / useless / looking in the wrong place / any of those; it wasn’t that, they had gone missing and have since been replaced. Failure is always more tiring than success, and we were really pleased when Richmond Bridge came into sight, and we headed back to the station to start our journey home. 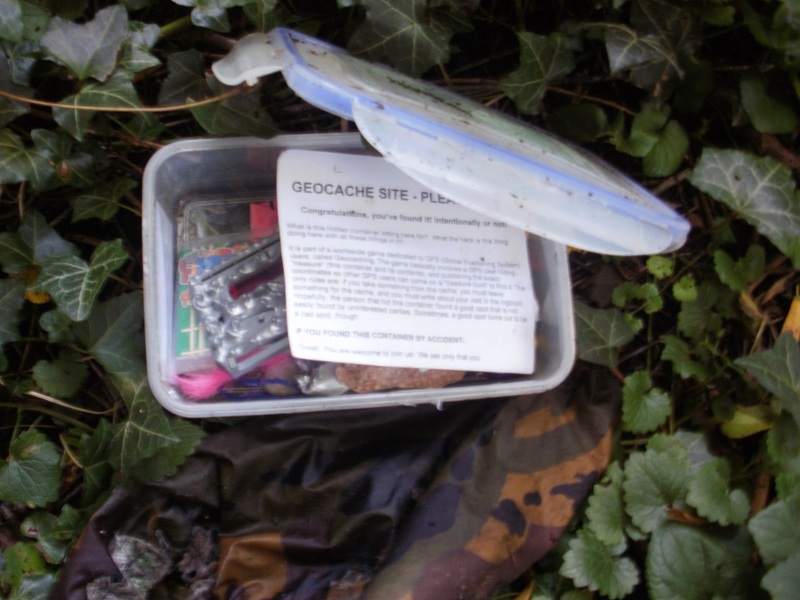 It had been a superbly varied caching day (oh, how varied!) on such a beautiful day. 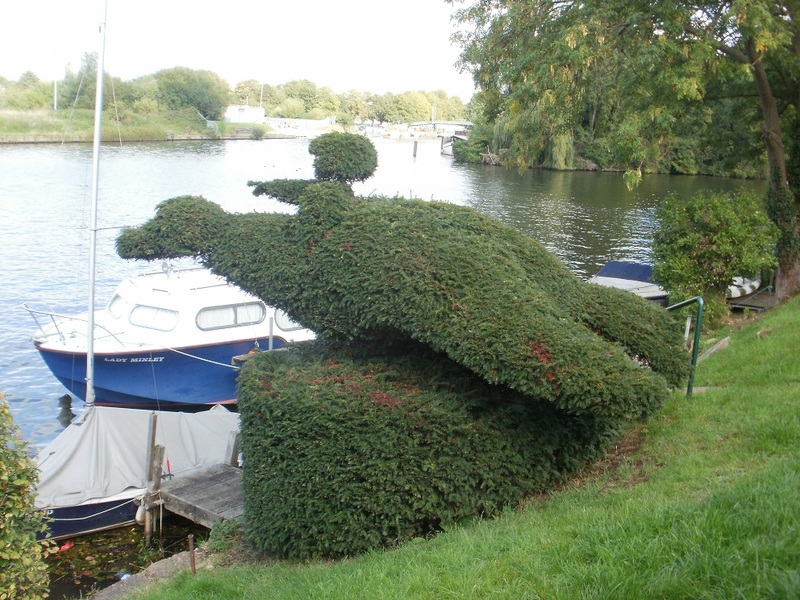 During our last section of the Thames Path (Walton to Hampton Court) we found a trackable. Most of the trackables we’ve found have been a ‘trackable dog tag’ with the unique trackable number etched into it, and an object attached to it. This trackable was different as it was only the dog tag. These pieces of metal are relatively small, lightweight, and easily dropped if one empties a cache heavy-handedly. Anyway NORMA is relatively new, starting its journey near Ipswich back in May 2015. Its mission, like to many trackables, is to visit lots of places but ideally Norway. Its journey from Ipswich to London is clearly in the wrong direction! Whoops! Today’s section of the Thames Path comprised starting at Walton, at the free parking we used last time round, downstream to Hampton Court, and then catching the train back to Walton and walking the mile or so back to the river. Sounded simple. Setting off from Walton Bridge on a clear, cool, crisp autumn day, we turned aside almost immediately to look for ‘A Hard Place’, a cache hidden amongst bridge arches. Well, that’s where it’s said to be, but we couldn’t find it. Back to the river, and there were some cyclists about. Actually there were a LOT of cyclists about. Mr Hg137 paused to interview some of them (he does this a lot!) and found that they were cycling, off-road, from London to Brighton to raise money for the BHF charity. After not very long, dodging the waves of cyclists got a bit wearing and we turned gratefully aside to look for a cache just off the towpath. It was ‘Carry on don’t lose your head’, one of the ‘Carry on Caching’ series planted to commemorate the films; this one was placed close to Old Manor House in Walton, which was once owned by one of the people who signed the death warrant of King Charles I – he was beheaded, so it was a neat tie in between cache, film, and location. Back on the towpath, there were not quite so many people on bikes, and we collected three more caches Weir 1, 2, and 3. This gave Mr Hg137 an opportunity for some grovelling on the ground… While doing this, we found a trackable, Norma, and also found the first stage for a multi-cache, ‘Sunbury Church Ait’. 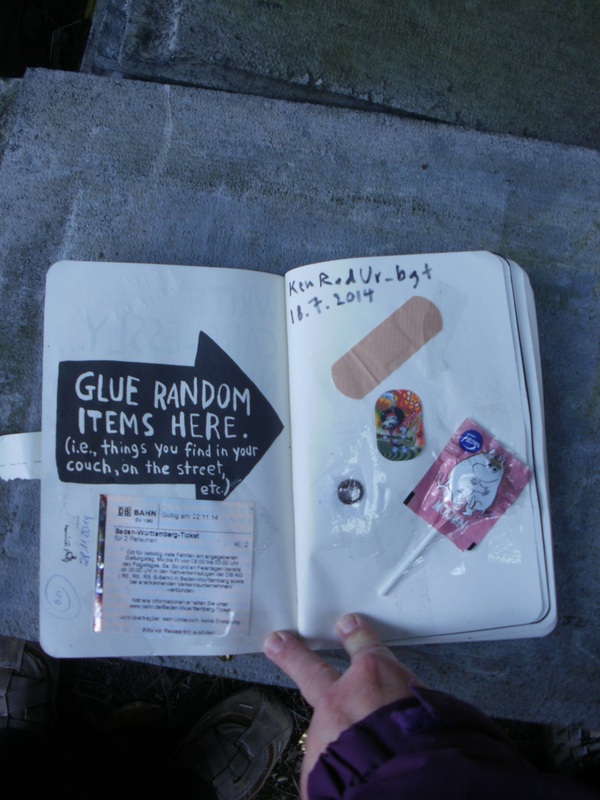 Multi-caches are, as you’d guess, formed of multiple stages, with clues at each stage which combine together to provide the location of the final cache. 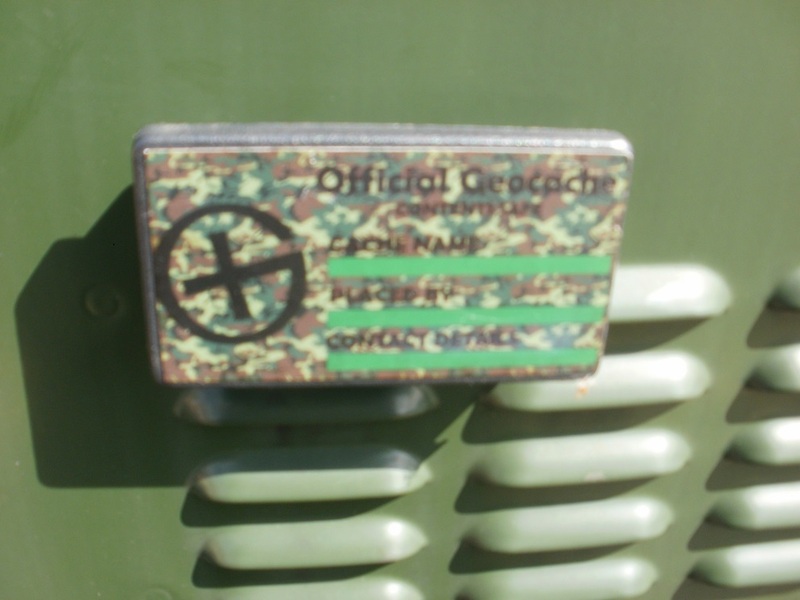 This particular cache had just one intermediate stage, for which we were grateful – we don’t have a stunningly good record with multi-caches. 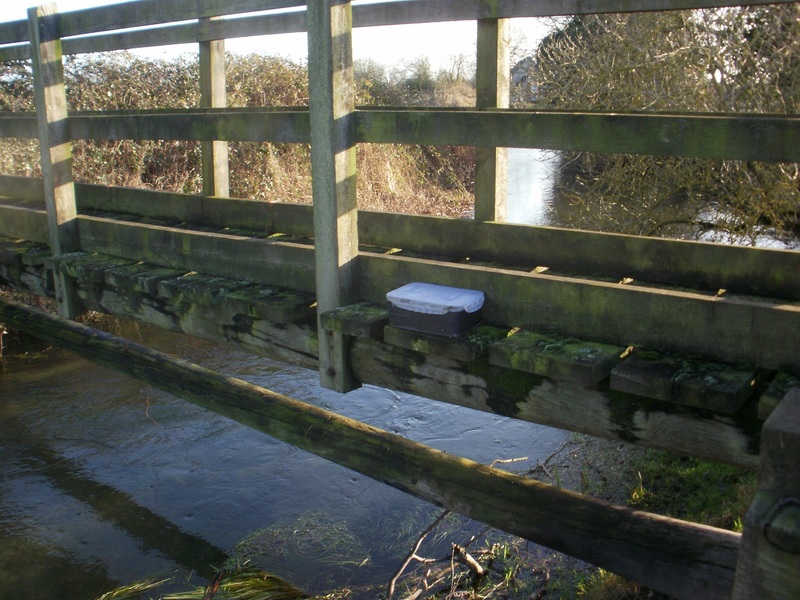 And we didn’t have high hopes for this particular cache, as it hadn’t been found for a while. 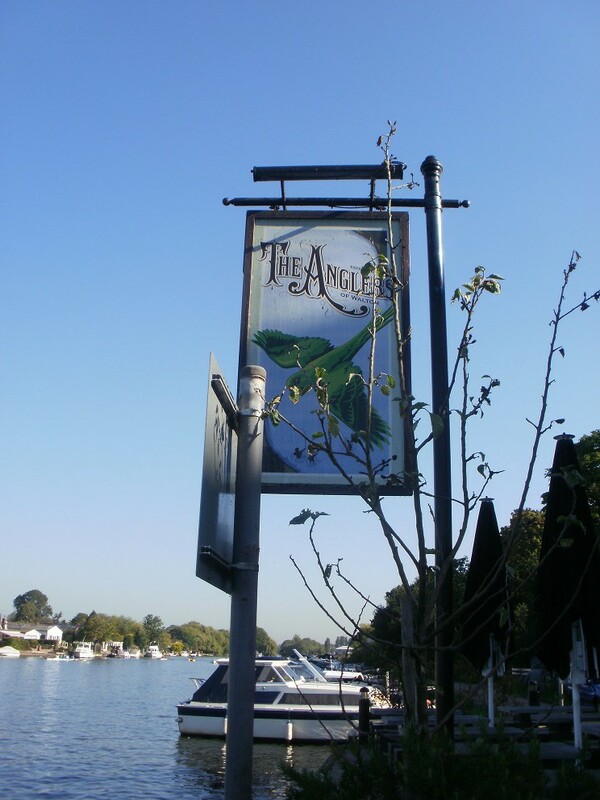 The clue led us onto one of the aits (islands) on the Thames, and into the undergrowth. A not-especially-long search found the cache. We were clever / lucky – hooray! There was a flash of gold from the river, and, emerging on the bank, we saw … Gloriana, HM the Queen’s royal barge http://www.glorianaqrb.org.uk By the time we had rejoined the towpath and walked to Sunbury Lock, the barge was there, too, waiting for the lock. And it seemed as if the world had stopped, and a reverential hush had fallen; along with the host of people who had appeared, as if from nowhere, we stopped to watch the spectacle of Gloriana descending the lock and moving away towards London. Sometime during this, a man dressed as a Smurf ran by, and folk barely noticed! We had mixed fortunes on the remainder of the five caches we attempted before arriving at Hampton Court. 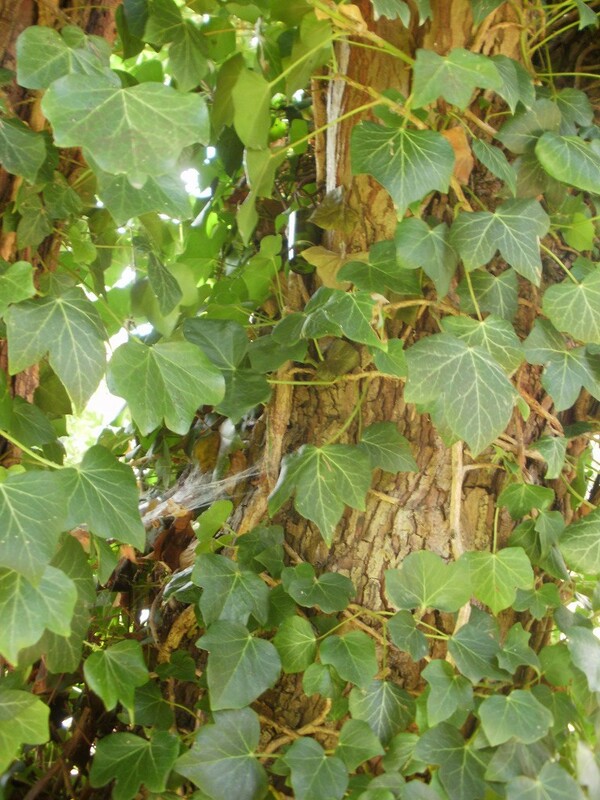 We found just two, though in mitigation I’d say that one cache was overrun with muggles, we cut short the search for another to rush for a train, and one was hidden in ivy – we’re rubbish with ivy! A train ride brought us back to Walton on Thames, where we failed to find yet another cache, one of the ‘Sidetracked’ series. It seemed a long, long mile back to the river (maybe we were getting tired). 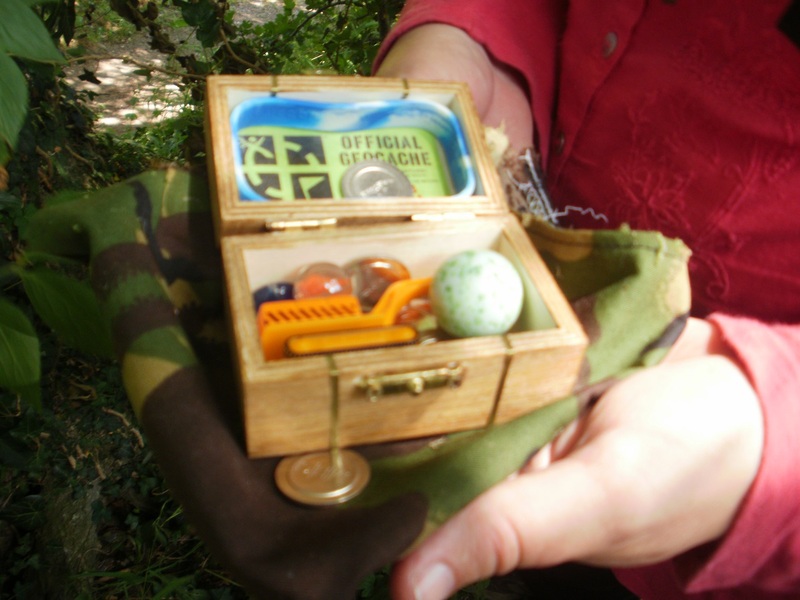 We found two more caches, ‘Centenarian plus3’ and ‘Carry on Doctor’ – another in the ‘Carry On’ series’. And then the final cache of the day ‘A Tricky Place’ . Another one we didn’t find. It was quite difficult, a difficulty/terrain 4/4 and we worked out that it was hidden under a footbridge, but we didn’t have waders or a boat with us, so we decided to stay dry and leave that particular cache for others. In which we are given an unexpected gift, accidentally prevent a cache from being found and ring a bell to catch a boat! Prior to most of our caching trips, we undertake research. 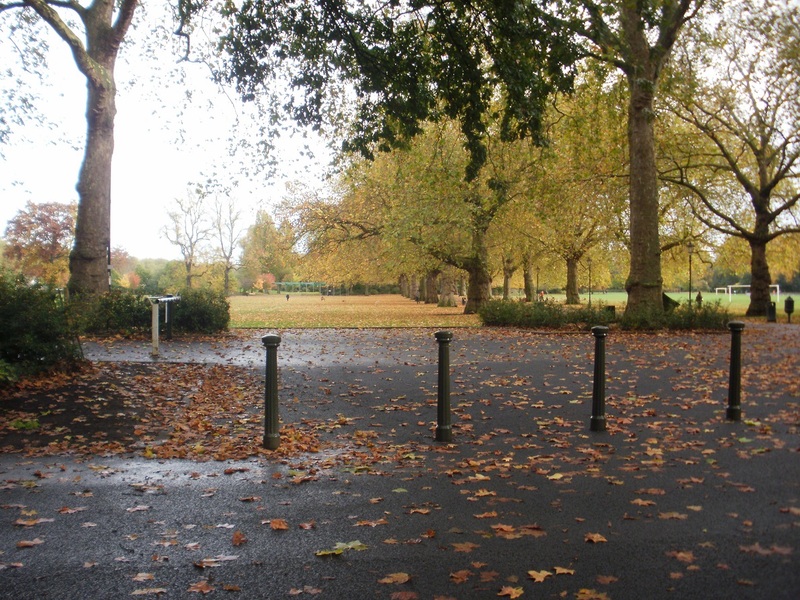 In the case of the Thames Path we research where to park at the start and/or finish and how to return to any parked cars at the end of the walk – ideally without incurring the large car parking fees associated with being close to the River Thames. Our research today found several free, yes free, parking spaces near Walton Bridge, our intended destination. Better still there was a bus service that would take us to Staines where our walk would start. Excellent! Not only that but the car parking spot was very easy to drive to (about 5 minutes from the M3!). While we were waiting at the bus stop – or more correctly double-checking we were at the correct bus stop, we were approached by a local resident in his front garden. “I’ve something you might like”. “Oh” we replied unenthusiastically (our minds were thinking about a bus due in a minute or so time). We took them. He accepted no money for them. A pair of practically new walking poles. What a start to our day! Just as we were trying to collect our thoughts along came the bus for our short trip to Staines. 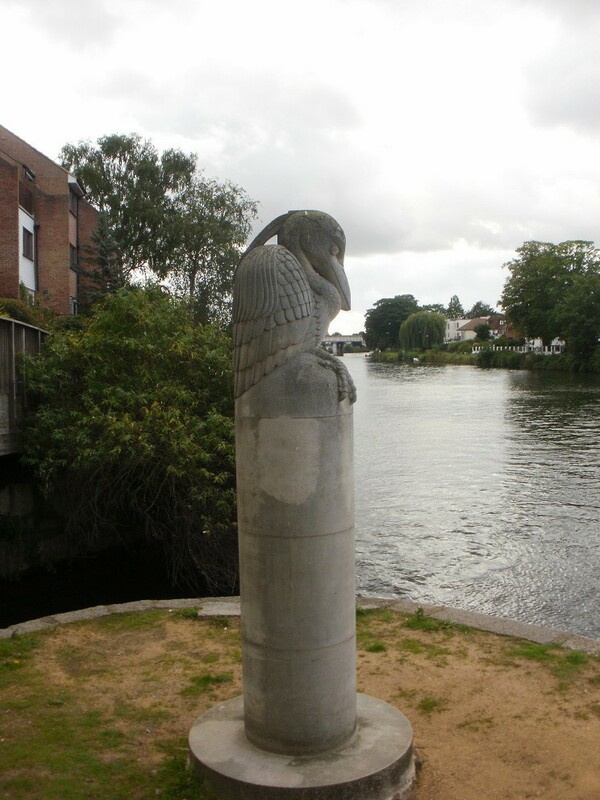 At Staines, or as we have mentioned before, Staines-upon-Thames, we made our way from the bus station to the river. But not before our first cache of the day, under a seat near the war memorial. With two seats to choose it shouldn’t have taken us too long to find the nano.. sadly it did! 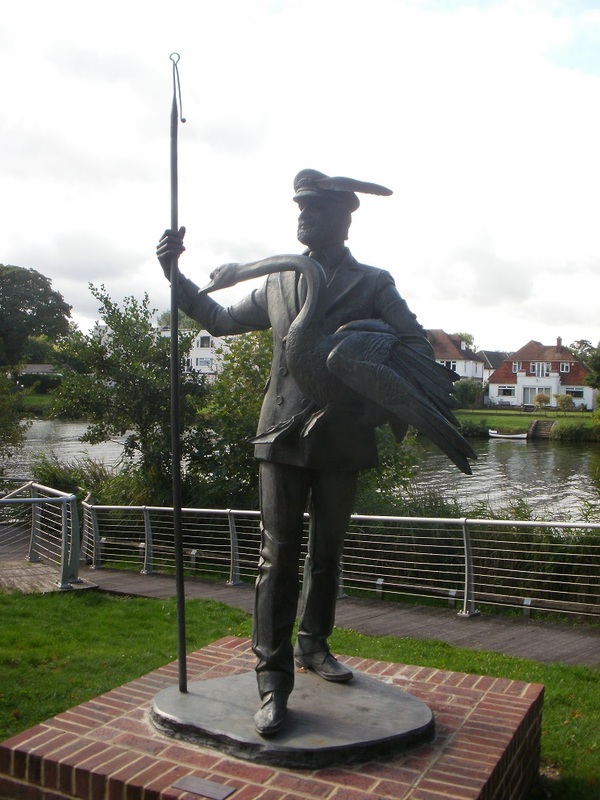 Within yards of resuming our walk along the Thames Path we encountered several monuments, statues and sculptures. 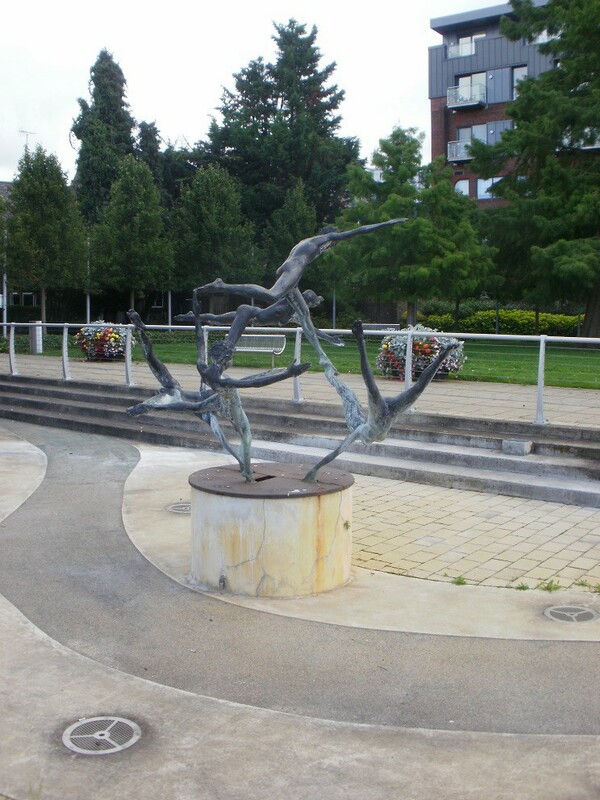 Modern sculptures, the original London Stone marking London’s original jurisdiction of the Thames as well as a heron and a swan-upper .. all with yards of each other. None of them hid any caches though! Our 8 mile route had few caches on the Thames Path, so after a couple of miles we broke off to visit the town/village of Laleham. 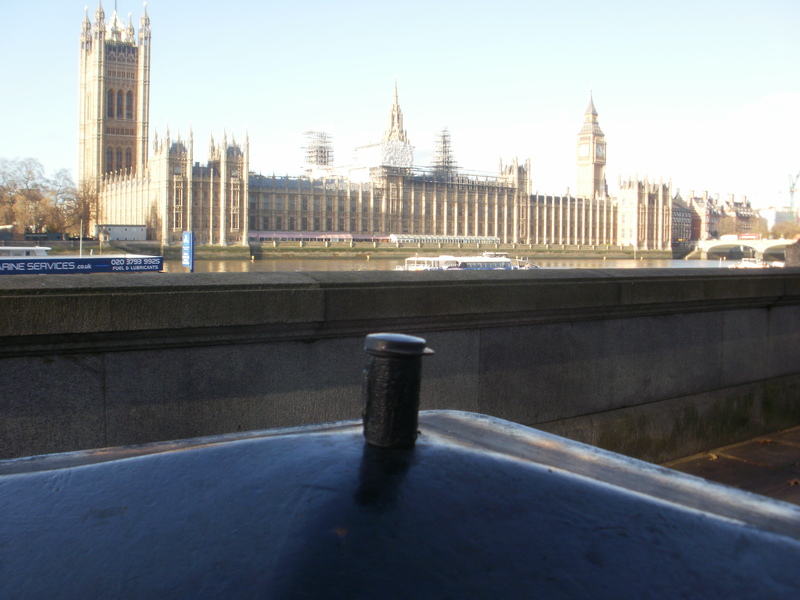 Here was a church micro hidden near a very un-church-like location – a litter bin! 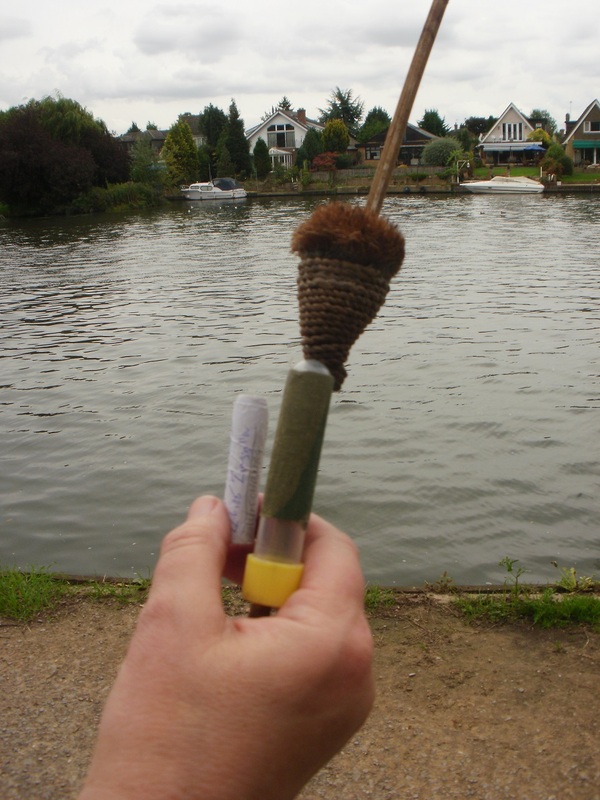 Our third cache on was back on the Thames, and quick easy find in a broken pole end. As we sat on a nearby seat, we became aware of runners coming towards us. They were in a race ! (Our previous Thames visit had something similar). This time we could just about read information on the tabards.. it was the Thames Path Challenge. 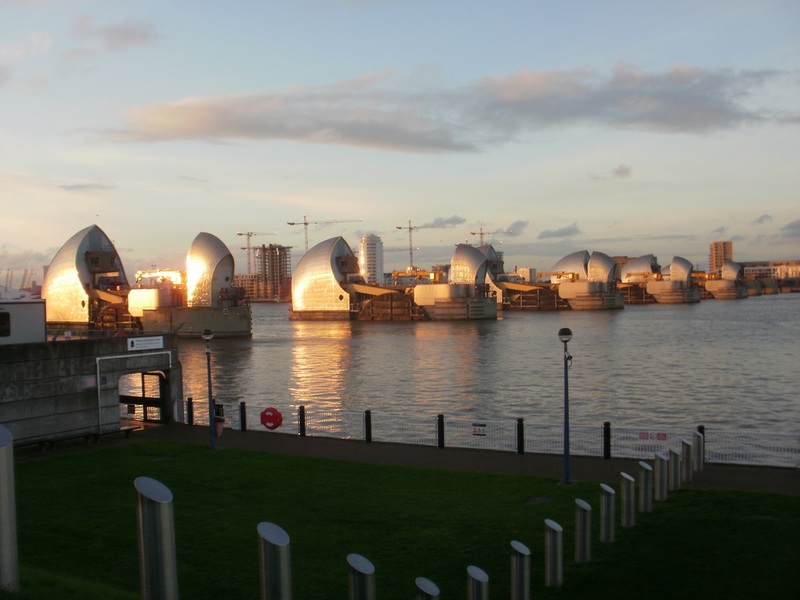 http://www.thamespathchallenge.com. 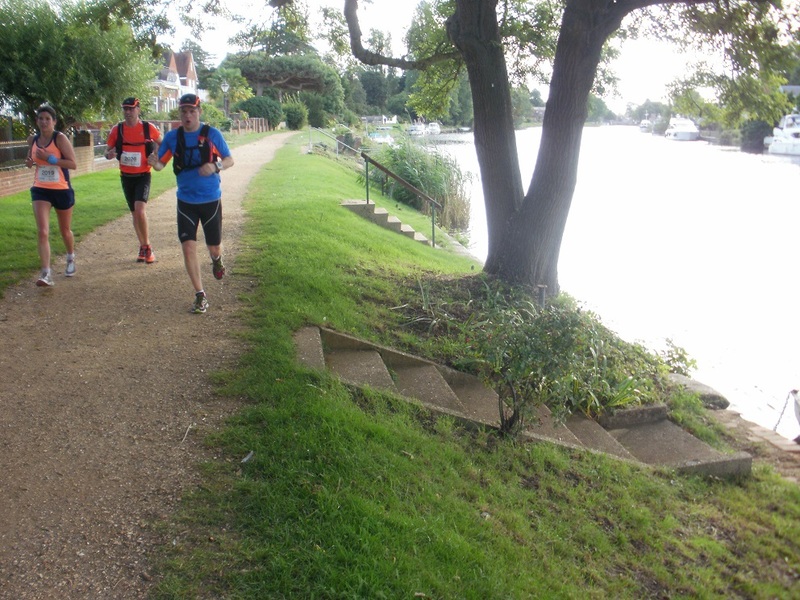 People were running (100km or 50 km) or walking 25km of the Thames Path coming straight for us! We gave a few a cheer as they went by, but our main efforts were dodging out of their way! Looks hard work to us! Eventually the path opened out to a wider green area, where our next target cache was to be found. “A bolt with a view” was the description so we knew what we were looking for.. a bolt. We spent ages looking for it, all the time being aware of a set of muggles arriving in the car park. 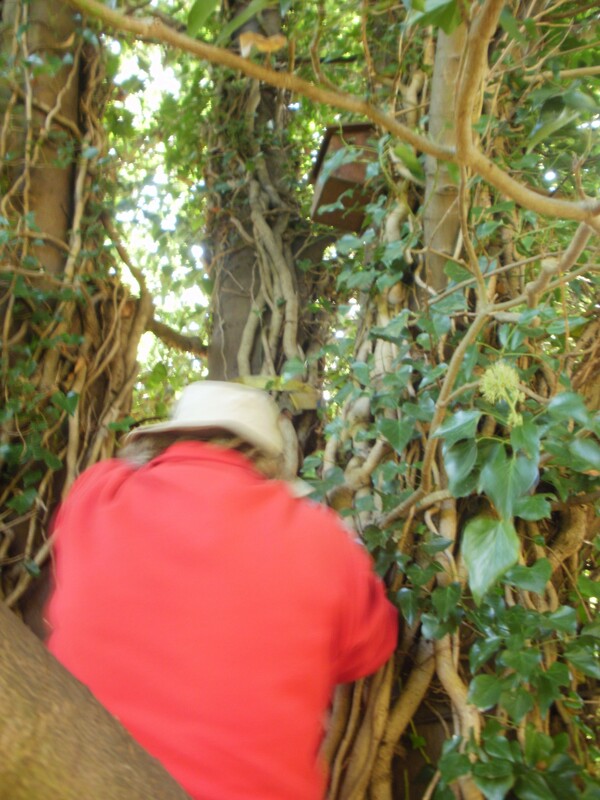 We checked all the obvious metalwork to no avail, then we looked in a tree (really.. we did!) and back to the metalwork. Aha! Got it! Unscrew it, sign the log..and repla…bother the muggles are now trying to get the pay and display machine to work in direct eye-line of the cache. Lets wait! We waited… and waited.. how long does it take to work a machine ? We waited.. Lets have lunch and replace it later. We made our way to a nearby picnic table and started to munch. Some time later we were aware of two people with two dogs near the pay machine. Had they just arrived ? Are they paying ? Are they exercising their dogs for a short walk ? No, they are looking for something. They are checking metalwork… and look they are checking the tree too… they must be cachers… and we have the cache next to our Cheese and Onion crisps. Whoops! 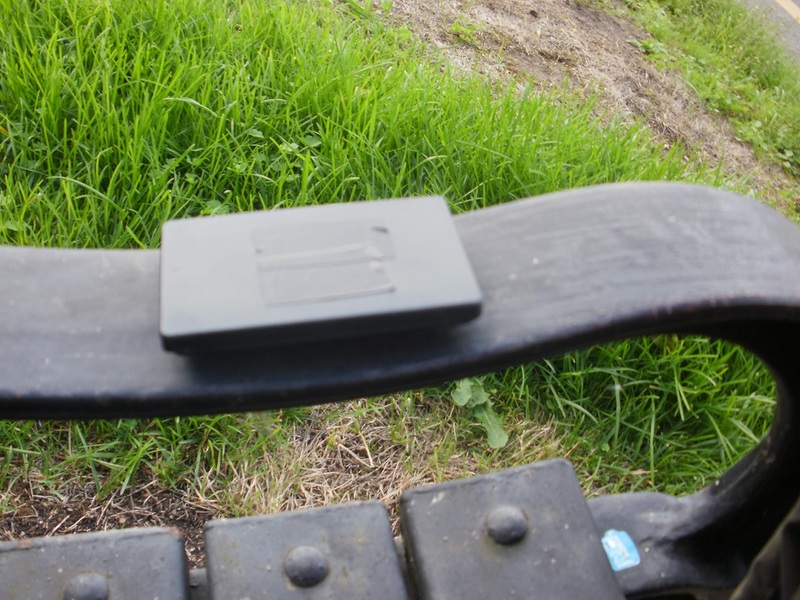 We ran over, well Mr Hg137 did, and discovered that they were indeed geocachers. We apologised for holding the cache (explaining why of course) and we jointly replaced it. It had been 5 months since the last geocachers we had seen (in Oxford) so it was a real pleasure to meet huskyhustlers1 and their husky dogs! 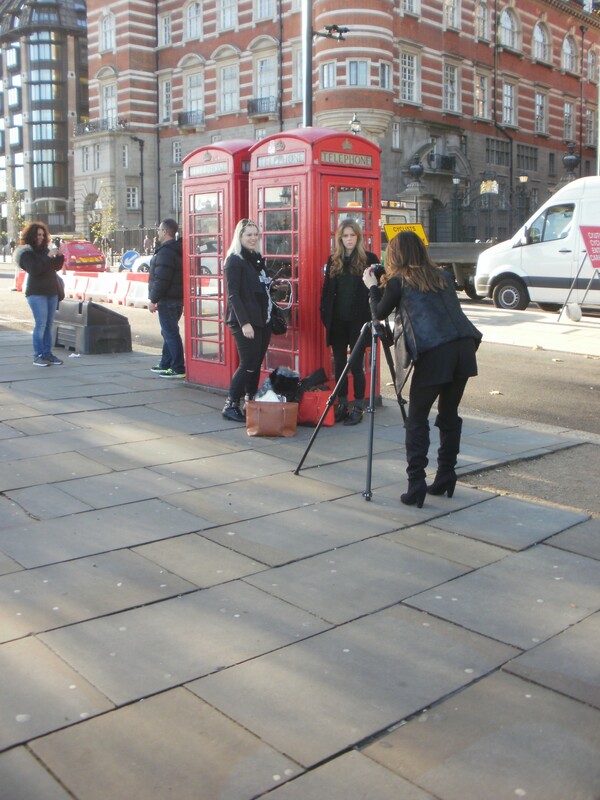 We eventually finished our interrupted lunch and then continued on the Thames Path. By now the trickle of charity runners/walkers was a steady flow, which meant finding the next two caches a tad tricky. The path was at its narrowest and only just wide enough for two people to pass – so trying to locate two simple caches (one hidden in Armco, the other in a tree) was a bit of a squeeze. We then had a long section to our next cache situated at Shepperton Lock (which we would have found a bit quicker if we’d had read the cache title!). Before we got there, we walked around a water meadow (we guess a euphemism for “flood plain”!). These meadows had become much scarcer approaching London, and according to the guide-book we are using, this was to be the last. Immediately after Shepperton Lock the Thames Path splits for the first time on our journey. The Northern bank route follows paths and pavements, slightly away from the Thames, for about 1.5 miles to Walton Bridge. The Southern bank route is a little shorter and follows the riverside all the way to Walton. The actual river more correctly follows the Northern route but with so many meanders, the flow of the river was so poor in the 1930s that a separate water channel, the Desborough Cut was built. The Southern bank route follows the Desborough Cut and from our caching perspective, 2 more caches. However to get to the Southern bank we needed to cross. There is no bridge, just a ferry. Although the ferry runs for much of the day, it is a request service. 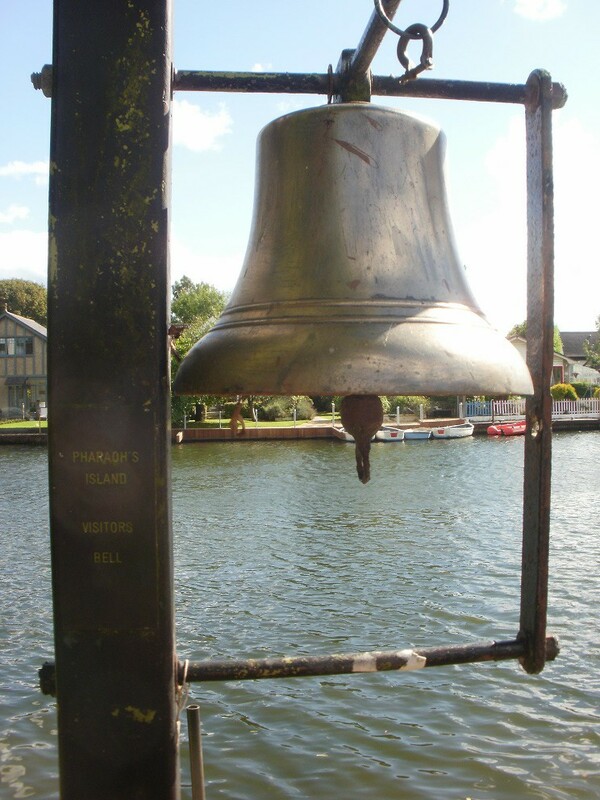 Every quarter of an hour the ferryman is summoned by ringing a bell. We waited 8 minutes for the appointed time, and rang the bell. Ring the Bell…Catch the Ferry! Some ten minutes the ferryman appeared and soon our 2 minute boat crossing was complete. One of the two caches we had to find was a puzzle cache based on a ‘safe combination’ we’d solved before leaving and another hidden somewhere deep in fallen tree-trunk, overgrown, nettly area. This was to be our only DNF of the day. The Southern route was very much quieter as the charity runners/walkers were on the Northern bank. 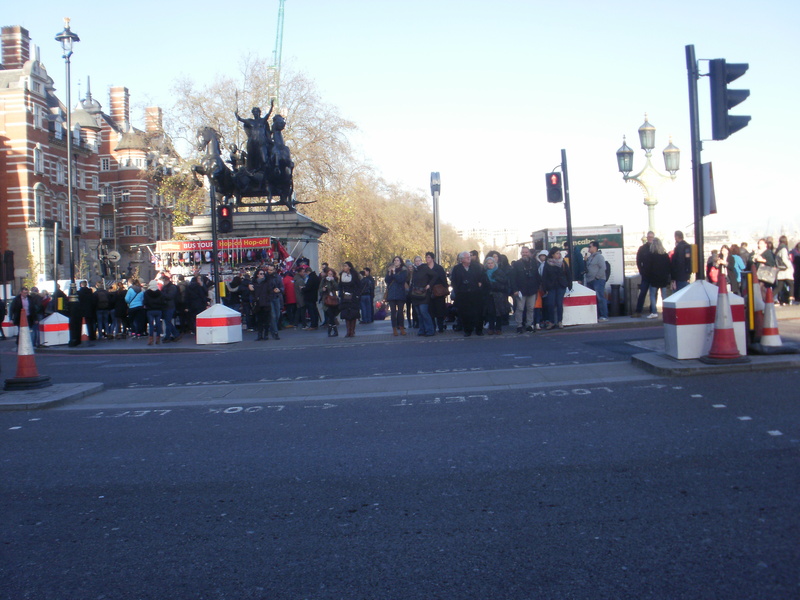 It was therefore a great shock to see hundreds of walkers going over Walton Bridge when we arrived there! Our last cache, with our best view of the river all day, was found with many of the walkers right behind us!